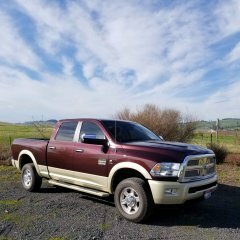 Hi, it looks like Dodge Ram did not start the OEM Gooseneck and fifth wheel prep package of under bed parts until 2013. Does anyone know if they would still fit a 2010 to 2012 or are there differences under the bed that would keep it from working? I'm liking the spread out 4 mounting holes for the fifth wheel hitch, especially if I get a short bed with a slider hitch. Bigger than a Grizz, Gentler than a lamb! Sorry no help here , best bet is Scotty I think. I do not know if they will work, but I do think you are on the right track. The nice thing about the factory puck system is ALL the weight and dynamic forces are put directly to the frame. No going trough the thinner and thinner beds. You’d have to check with a dealer and see if mopar offered that for those years. I’m not much help right now with not being at the dealership. I’m not familiar with the puck system that dodge uses. My pickup has a B&W gooseneck. Center section bolted directly to factory reinforced area drlirectly above axle. If you like I can snap a picture tomorrow of my setup. Hi Mark. I've been doing plenty of reading and think I understand how it mounts. Thanks for the offer though. With the under bed puck system, all 4 mounting points for the fifth wheel are mounted to the frame. Pretty sturdy IMHO for a slider. The OEM gooseneck hitch fits 2010 to 2018, but the fifth wheel system is only listed for 2013 and newer. I'm trying to find out if that is only because the first year offered was 2013 but it would / could fit a 2010 through 2012. Interests:My wife, fishing and hunting. I cant help with the retro fit into a older truck but if you get a truck with a bed setup this way Rusty has the 5th wheel hitch that came with his new to him truck I think he wants to get rid of. In 2011 a factory under bed gooseneck option (2010-18) was offered but not a 5-th wheel hitch option (2014-18). That is what I have been seeing also, but I don't (or can't) find a frame, exhaust, bed, or any reason why it won't work. I was hoping someone had hands on experience with a 2010 to 2012 and a 2013 and newer and could say that there is or isn't any differences that they noticed. Ai found the parts list and installation instructions. All of the parts they have in common such as the frame mounted brackets and plates are the same part number. I'm really thinking that both the fifth wheel and gooseneck hitches will fit a 2010 to 2012 as well as the 2013 and later. Aftermarket hitches such as B&W, Reese, Curtis, etc all have the same part number for the different years too. heck maybe even Ben might be up to a install if you couldn’t find installers there you trust ???? Be worth a conversation anyway. And if he installed you know his work quality would be top drawer ! !